So many different projects to get the creativity flowing. There are some excellent tips on how to teach crochet to children and how to knit a simple Pom Pom Scarf. I finished the Wavy Dishcloth by Knitpicks that has turned out well. I like how it has a different look on the reverse side. I am using up leftover yarn for a smaller dishcloth in seed stitch. It’s very bright with a little bit of orange and then the rest in purple! I will get on to the next pattern which is the Sasa Dishcloth by KnitPicks. 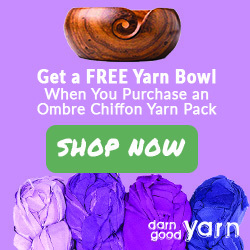 Darn Good Yarn is celebrating National Craft Month in March and offering some great freebies. Create your own version of this beautiful craft with the help of Maggy from Red Ted Art. This is such a lovely handmade project made possible by the creative mind of Anne from Flax and Twine. This video is about fun things to do with kids and craft supplies. Thanks to the The Team from At The Pool. Ashlea from Heart Cook Home has some fabulous suggestions for this gorgeous craft. Check out the complete guide. Find all the details for this fabulous craft project by Linda from Craftaholics Anonymous here. All the details for this crafty idea Lindsay Small from Activity Village can be found in her post. To create this craft project Lainie from Makerland follow the instructions she has given. This video features some great ideas for easy crafts for kids! Plenty of inspiration to be found here by The Crafting Hours Team. The instructions to follow Sarah from Repeat Crafter Me are here. Super fun to make Marie from Make and Takes. You will be super excited to create this beautiful craft Lisette from Where Imagination Grows. Ashley from Make It and Love It has created clear and easy-to-understand instructions to help you make this craft project. Find the inspiration from Lisette at Make and Takes here. Birute from Make and Takes shares their experience and tips for how to make this craft project. Heidi from Happiness Is Homemade shares the information here. To create this craft project follow the instructions Carla from Inner Child Fun. Read all the details here Dinah from DIY Inspired. Nicolette from Powerful Mothering steps you through the techniques used in this brilliant project. A really wonderful idea, this craft by Heidi from Happiness Is Homemade makes use of some great materials. Jackie from Happy Hooligans gives great step by step instructions on how to make this gorgeous craft. Follow the tutorial Kim from Inspiration Made Simple. Ashley Rives from Lovely Commotion makes this look very easy! Kate from The Craft Train steps you through how to put it all together. Rachel from I Heart Crafty Things steps you through her crafty idea. Heidi from Happiness Is Homemade provides all the details for this crafty project. Maggy from Red Ted Art has done an excellent job, find the complete guide here. Danya from Danya Banya has created this beautiful project for you to follow. Check out the guide Melissa from Fireflies and Mud Pies here. Find all the details for this fabulous craft project here by Jenn from The Girl Creative. Bring some easy and amazing crafty goodness into your life with craft Jamie from Crafting Chicks. Amanda from Crafts by Amanda steps you through the requirements to make these very creative ideas. Thanks to Kim from Make and Takes. What fun it will be to create your own version of this craft project with the expert assistance of Cathy from The Girl Creative. What a gorgeous handmade project made possible by the creativity of Heidi from Happiness Is Homemade. Debbie from One Little Project has some excellent suggestions for this crafty idea. What you need for this wonderful craft project. Jamielyn from I Heart Naptime has the details in her post. Creating this fun craft project Katie from Made To Be A Momma and follow the easy to follow instructions she has given. The instructions to follow by Allison from No Time For Flash Cards are here. Super fun to make craft idea Emma from Kids Craft Room Follow the steps to create your own here. Your creativity will be flowing when you create this beautiful craft. The Six Sisters Team from Six Sisters Stuff. Jean Vant Hul from Artful Parent has detailed clear and easy-to-understand instructions to help you make this craft project. Find the inspiration Heidi from Happiness Is Homemade here. Allison Waken from All For The Boys shares their knowledge and helpful tips on how to make this craft project. Agnes Hsu from Hello Wonderful shares the information here. Follow the step by step instructions Kate Jones from Our Best Bites. Read all the details here Michelle from Crafty Morning. Heidi from Happiness Is Homemade steps you through how to make this funtastic project. A superb idea, this craft Jackie from Happy Hooligans makes use of some great materials. Jodie and Jen from Eighteen25 gives great tips and tricks on how to make this fun craft. Follow the tutorial Jean Vant Hul from Artful Parent. Jamie Sanders from Scattered Thoughts of a Crafty Mom makes this look easy and fun to do! Merissa from Little House Living steps you through how to put it all together. Stacey from Glued To My Crafts steps you through her crafty idea. Kim from Inspiration Made Simple provides all the details, including materials and how-to tips for this crafty project. Amanda from Make and Takes has created this sensational craft project for you to follow. Check out the guide Jessica Holmes from Candle in the Night here. Such a great handmade project. Vicky from Mess for Less has such talent, find the complete guide here. Heidi from Happiness Is Homemade has created this awesome project for you to follow. Holly Homer from I Heart Crafty Things has some fab crafty ideas, which you can try out. Find all you need here by Holly Homer from Kids Activities. Bring some amazing and satisfying crafty goodness into your life with craft Nicolette from Powerful Mothering. Crystal from Crafts Unleashed steps you through the instructions and provides ideas for materials to make this very creative idea. Thanks to Heidi from Happiness Is Homemade. Hope you found a fabulous Easy Kids Craft project to try out. I’m sure plenty of other people would love the Easy Kids Crafts.